It's interesting to think of the events of "The Gathering" in light of the information we gained from jms in the bonus 15th scriptbook. From the information gained in the narrative write-up that jms did about where the show was going with Sinclair as the main character, written back before Michael O'Hare left the show, the assassination attempt on Kosh stands in a different light. 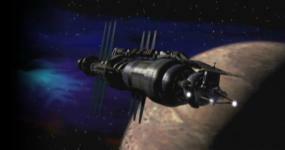 The original planned finale for Babylon 5 was that the station was going to be destroyed by the Minbari. The Minbari warrior caste had overthrown the Grey Council and were in control of the Minbari government, and they were going to attack and destroy the station. In The Gathering, Delenn says that the assassin belonged to a certain group from within the warrior caste; my guess is that he was a part of the same group that was going to spearhead the overthrow the Grey Council and lead the Minbari to destroy the station. I imagine that group was the Windswords, which Lennier identifies as the group that supported Deathwalker. Thanks vacantlook. this does explain where they were going with that. I immediately thought Windswords when the 'group from within the Warrior Caste' was mentioned. I expected further dialogue going in that direction, but it didn`t happen. I am watching The Gathering now, and I have a question...or really more of a puzzled observation. When Kosh`s ship is docking at the station, control of his ship is turned over to C&C. Yet later in the series much is made of how big a mystery his 'living ship' is. So, how did they control and dock it? I just assume that the B5 computer sent the spaceship Golden Shot type commands - up a bit, left a bit, forward, faster and stop. The spaceship's own computer would work out how the instruction was obeyed and may be able to veto it. The instructions may even be in a standardised protocol, there are plenty of other spacestations around. One detail that I hadn't previously noticed and that actually caused a double-take was the presence of Ed Wasser (aka Mr. Morden) near the end of the pilot. He's one of the crew (I'm not sure whether military or civilian tech) that helps to stabilize the station after it has been put out of whack by the bomb! Yup! Two totally distinct characters, and the similarity is never explained. After that they usually just went with putting the same actor in different alien masks. If you listen closely, you can hear very familiar voices at times: Ombuds Wellington from Season 1 is G'Kar's uncle in Season 2, and Wayne Alexander (Sebastian) turns up in two other very different roles... finally there were the "B5 Rep Company" actors, who played literally dozens of different aliens. Part of the reason all the Drazi sound the same is that Kim Strauss played most of them. Oddly enough for a character with so few lines, Ed Wasser's character had a name in 'The Gathering', Guerra. When I had him sign some scripts for me a while back, he was careful to note "Guerra" on the Gathering script and "Morden" on the others. I thought that was cool. Two totally distinct characters, and the similarity is never explained. I'm reminded of the actress who plays the doctor on Crusade and had a very different role in - was it CtA? JMS' commmentary explained that they were perhaps twin sisters. So perhaps Morden is the evil twin? So few lines? Doesn't he say, "On it!" and that's the last we hear from him? That's not a line, that's not even three syllables! Very cool about Guerra, though. The best Ed Wasser story I ever heard was when he walked into a store, and the man behind the counter said, "What do you want?" Wasser gave him his order -- and the man said, "But what do you want?" That's a good one, alright!